Obama's latest commercial is receiving wide press attention for it's cleverness and audacity. Some people in the McCain camp criticize the commercial for playing the age card. But the Obama camp claims that McCain's age is never explicitly mentioned in the ad. Voicover: "Sure, this war-horse has been around the block. But what do we really know about him?" 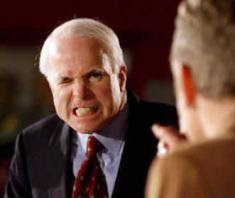 More pictures of McCain looking mean and nasty. Distorted, maniacle voicover of McCain saying, "bomb, bomb, bomb Iran!" Voiceover: "Can this septigenarian stand the stress of being President? Or will he snap and push the big red button?" Picture of McCain's possibly cancerous mole. Hospital emergency sounds. Picture of red telephone ringing insistently, no one answering. Picture of concerned voter, mother of three. "I respect his sacrifice undergoing all those years of torture as a POW. But I'm afraid of what he might do now if he were in charge of the country. My grandfather got old, and he became irrational and mean. Once he tried to put his hands in my, you know, private area. We had to send him to a place for old men like that. And he hung around like that for years." Switch to Obama, sorrounded by children on a field of poppies. "I'm Barack Obama. I'm forty-six years old. And I approve this message." Meanwhile, John Smear's new book, "McCain...Insane," debuted today at Number 1 on the New York Times best-seller list. Smear is the best-selling author of 2004's "George Bush: Literally Retarded." "We have evidence that McCain suffered a severe mental breakdown due to his internment in a prison camp. He has admitted to beating his wife, and we suspect this is related to his deep psychological problems and his many adulterous affairs." Independant fact-checkers have pointed out to Smear that the affair he is referring to, with lobbiest Vicki Iseman, hasn't been substantiated. "Edwards denied his affair too," Smear says. "Case closed." The wife-beating incident Smear is referring to stems from a joke McCain made on the campaign trail. "McCain literally told the press, 'I stopped beating my wife a couple years ago,'" says Smear. "It's common for elderly wife-beaters to start to joke about their actions this way. They feel it makes the listener then question whether they really do beat their wife, since they're willing to joke about it. And they sometimes forget who and where they are." While there is little evidence that McCain beats his wife, average voters may need more convincing. "I hear McCain beats his wife," says Joe Hearsay of Wippefalls, Vermont. "I just don't feel comfortable voting for a wife-beater for President."